Hey, you know when you’re good at something. We know we’re great at raising the highest quality bird possible, and slow cooking them to perfection. 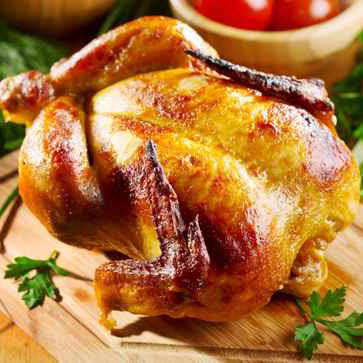 You can call any day of the week to order a chicken roasted ready to go for you! We just need an hour’s notice, or you can chance it and see if there’s one ready by walking in! We highly recommend reserving one, because they don’t sit too long here. They’re stuffed with a careful ratio of Parsley, Sage, Rosemary, Thyme, and Garlic, and rubbed in Oil, Salt, and Pepper. They’re served with a wheat bread crouton, cooked in the drippings from the chicken as it cooks. Call any time of the day! All orders MUST be placed by 4:45pm that day to guarantee yourself a delicious bird. 908-359-5218 ext 2 to be immediately directed to the store!